The rehearsal began with a shower of rain, but it passed very quickly. We decided to try and run through the processional a couple of times in between downpours. To our amusement, the rehearsal became a series of dashes for the cover of the tent and then a dash back out to practice the order of service. We made the most of our time in the tent to go over the minor details, leaving us free to work on where we needed everyone to be located on the day of, without wasting the time between soakings. Everyone was in great spirits and the location of course, was stunning. Searles Castle cannot be beaten for its beauty. The couple were very easy to work with and the bridal party very helpful. A joy of a rehearsal. Next day the sun came out for the bride and the rain clouds dissipated, and the day rapidly became quite a scorcher! I had been looking forward to this wedding a lot as it had a lot of unique elements. A chuppah, sand ceremony, benediction of the wine, placing flowers in a vase to honour the deceased, and breaking of the glass at the end of the ceremony. All in all a very visual wedding. The couple gave their personal vows to each other prior to the legal vow exchange, and emotions ran high, but nothing will compare to the tears of joy that fell from the eyes of the groom when he first beheld his stunningly beautiful bride. For me that one moment will be etched on my memory forever. The look on his face was indeed the picture that painted a thousand words. Such love leaves us in awe of these moments. The flower girl performed her duties with grace and the biggest smile I have ever seen, the groomsmen and the bridal party remained fresh, elegant and composed under the now brutal sun. What a great wedding! 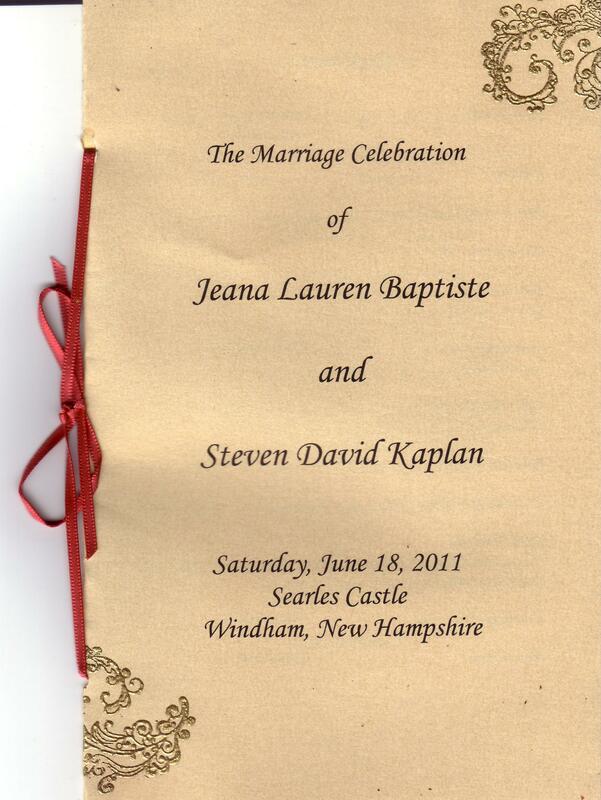 Congratulations Jeana and Steven!!! Mazel Tov! Click on Photo to see Album! Hi Rev. Ashe – I wanted to thank you for doing such a wonderful job with our ceremony. Many people commented on how personal you made it feel. I really appreciate the time and effort you put into writing up the ceremony.